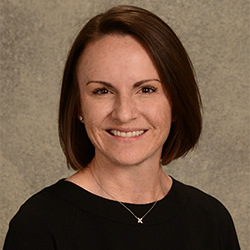 Lindsey Hoffman, DO, is an Assistant Professor of Pediatrics and investigator in the Morgan Adams Foundation Pediatric Brain Tumor Research Program at the University of Colorado. She did her undergraduate work at William Jewell College and earned her medical degree from Kansas City University of Medicine and Biosciences. She served as a pediatric resident at Texas Children’s Hospital/Baylor College of Medicine and completed fellowship training at the University of Colorado, where she worked in the laboratory of Dr. Nicholas Foreman studying ependymoma biology. She is now leads the cancer predisposition program in the Center for Cancer and Blood Disorders and is an active member of the experimental therapeutics team focused on development of clinical trials for high-risk pediatric CNS tumors at Children’s Hospital Colorado.